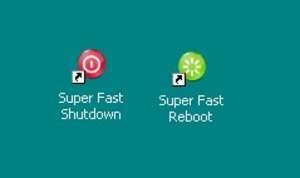 Have you ever wished there was a faster way to shutdown your Windows system? I mean instantly shut it down! Now you can! Just install Super Fast Shutdown and click on one of the desktop icons created to reboot or shutdown. For security reasons, you should also check out the SuperFast Shutdown download at LO4D.com which includes virus and malware tests. Additional screenshots of this application download may be available, too. 3.8 out of 5 based on 15 ratings. SuperFast Shutdown has a presence on social networks.